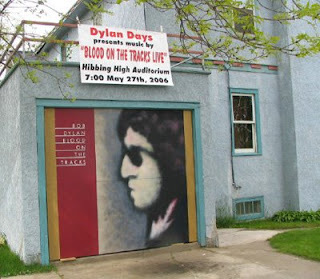 Direct from Bob Dylan's garage in Hibbing - Google translation/what a translation of Kistalights Hibbing blues - just for the american readers! Svd in Sweden with Kristin Lundell has been in Dylan's hometown in Northern Minnesota on reportage trip. - God, how jealous we are! Great travelogue with a myriad of fine details, interviews and well-chosen images. Everything from Hibbing high schools famous auditorium, restaurant Zimmys caring Dylan Heritage in town, a Dylanolog Bill Pagel who runs a website, Bob Links, about Bob Dylan. And the young music student Iris Kolodji, who makes a lovely interpretation of You're gonna make me lonesome When you go. - Great Dylan Classics there on harmonican in Hibbing highs auditorium! The thesis of the story that there is a mutual silence between Bob Dylan and his old hometown is not really true. - For sure we Dylanologs and bobgeeks thinks that! Which we immediately brings up an example of! The introduction to Desolation row, Bob Dylan's own Union of the speech, is a Dylan surrealistic Fellini Ballad of life in an American small town. An evocative ballad with a lyrical tone and a very melancholy spirit. Of course it could be Hibbing and perhaps a small town anywhere in the Midwest! According to the what myth teaches there are postcards from a mob in the 1920s in Duluth, (neighboring city of Hibbing, where all iron ore were outshipped from Mesabifields out over the Great Lakes and it was Dylan's birthplace) when three colored men were hanged without trial in a crude racist lynching. An image that Dylan had as a model for his surrealistic ballad. Considerably more social realistic and grounded in the environment and with lawsuits from Hibbing's is the text, 4 Outlined epitaphs, on the back of the disc (vinyl) The times They are a-changing. Wise words from a very young man with a scarred man's face on the front panel of the vinyl. The picture is certainly inspired by a classic Woody Guthrie portrait! Why not listen to a Dylantune, North country blues, which tells of Hibbings history with an early example of globalization influence in markets, miners' fate and impact of capitalism on a country district! A very young Bob Dylan from Newport folk music festival in 1963 as a guitar playing storyteller with an old man's voice. Small town, community, be cheering for the neighbor kid, everyone knows everyone, main stream, social control and the law of Jante! There was a young poet and musician, Bob Zimmerman, with the feeling of having a special talent (an inner world of images and emotions) to find the way out of Hibbing? Iron Barge The foghorns in the fog on Lake Superiurs as lighthouses in an inland sea where the ore was shipped away to the big cities and urban life in Chicago, Detroit or Montreal. - Could it be the way out? Or highway 61 down to Minneapolis - blues own way, St. Louis, Memphis and New Orleans. The road, like so many colored musicians have been traveling in the opposite direction to escape oppression and injustice in the American South. Somewhere there was another world! The truth is also that all burrows from Hibbing to Albuquerque once was founded by people who sought freedom and a new life. Well some were certainly adventurers and on the run from both the one and the other. Burg thus as part of the American project! - As it now was a time to escape from! Bob Dylan found his way out through a wild identfikation with Woody Guthrie and his lyrics and music. Something that brought Bob to New York, Greenwich Village and a visit to the then sick folk singer Guthrie. What got Bob to write Song to Woody who became one of his first own songs. In Chronicles, Bob Dylan's acclaimed memory chronicles, asks his first music publisher Lou Levy of Tin Pin Alley if he ever written a song about a baseball player. That's when Bob hears about Roger Maris in The Yankees is going to break all records in terms of number of home runs. Roger Maris was from Hibbing Minnesota of all places. There was no Bob had heard of! No one else for that matter! In the city up north! Bob still feel a certain pride! Over to be from the same town as Roger Maris! - A homerun for Hibbing?! PS Of course a guy carry with him his homeland through life! Something that pervades Dylan's music and lyrics and he tough, almost like a Hemingway, refers to in Chronicles - the chapter Frozen River. There, Bob very interesting talks about the inspiration behind all the early great songs and origins of his artistic thaw. Earlier we wrote like this from Kistalight på spaning 2010. Literary models were the French symbolistpoeten Arthur Rimbaud with his lettres and especially Je est une autre. Dylan followed by girlfriend Suze Rotolo rehearsals of Brecht and Weill's Pirate Jenny, and even there were brought ideas for future songs. The shape, structure, the songs were inspired by Hank Williams versemaking. Of his producer at Columbia, John Hammond, get Bob a disc with the title King of The Delta Blues. The singer named Robert Johnson and Dylan teeth immediately when he sees the disc cover. Johnson is a bluesman with guitar and harmonica who write their own songs from the American South. Dylan writes down and copy Johnson's texts to find out the secret behind the construction of the sparkling allegories, the old verses, the free association, the crushing truths wrapped in a hard shell of abstract nonsense that flew through the air with the greatest of ease. Woody, Pirate Jenny, Rimbaud and bluesman Robert Johnson is equal to true, perhaps topped with some additives grass and Dylan writes, that in a few years I would write and sing songs that It `s all right Ma, Mr. Tambourine Man, Hard rains a gonna cases and the like.